Glædelig Jul, everyone! That's Merry Christmas in Danish because Denmark is the country we learn about today! Pictured above is Denmark's capital, Copenhagen with all it's beautiful Christmas lights. Christmas in Denmark is called Jul, which means 'feast' in the old Nordic language. There has been a winter celebration for hundreds of years in Denmark, dating back to pre-Christian times, when it was the festival of the pagans. In the Middle Ages, when Denmark became Christianized, Catholic traditions mixed with the ancient Nordic tradition. Candles, food and money came to be given to the poor. This is known as the Feast of the Candles. In the country, however, very little changed. Christmas was a time of literal magic, a pagan celebration filled with superstition. The people would leave bread on the table through the holiday and spread it across the fields before sowing their crop. This was supposed to ensure a good harvest. Following the Reformation, the Church was eager to get rid of old traditions, be it Catholic or pagan. People in the country baked, butchered, made candles and cleaned everything inside and outside. Then the family would get their Christmas bath (I'm hoping this wasn't the only time a year, but it's hard to judge the people who had no indoor plumbing). Christmas brought goodwill to other people as well as to animals. Grain was left out for wild birds and domestic animals got extra food for the time. All work was banned during the holidays. Though Christmas gifts were not common yet, it was gaining popularity in the cities. Still, servants and employees were given a Christmas bonus of bread or cakes called apple slices. Apple slices are still eaten in Denmark today along with a hot punch made of red wine and brandy or snaps with pieces of almond or raisins in it. This traditional beverage is called glögg. The time of Reformation brought a great reformation to Christmas traditions as well. Many new traditions were added during this time. For instance, the idea of the Christmas tree made it's way to Denmark from Germany and the first trees were decorated with paper decorations as well as candy, fruit, Danish flags and candles. Christmas gifts and cards started around this time and the idea of the Christmas 'nisse', a little elf who is said to control your fortune. Families left out a bowl of porridge out to please him and try to keep his jokes in check. The nisse was dressed in a grey sweater and pants and red stockings and hat with white wooden clogs (see the picture above). Christmas continued to be reshaped through the start of the 20th century, picking up traditions from other countries and mixing them in with those already in existence. Santa Claus came from the States, holly from Ireland, After WWII, Denmark picked up more traditions such as the Christmas calendar, Advent wreath and Lucia parade. The modern Danish Christmas begins with Advent, which means the coming. This refers to the coming of Christ. Advent started off as a time for penance and fasting in preparing for the Christmas feast to come. The 4th Sunday before Christmas is the start of Advent. A wreath of pine twigs with candles and either purple or red ribbons is hung on that day and one candle is lit. The following Sunday another candle is lit and so on until it is all lit. Juleaften (Christmas Eve), is the biggest celebration of the year. Danes go to an early mass and dinner is served early as well. The Christmas fare includes roast duck or goose stuffed with prunes and apples, boiled potatoes, sweet potatoes, red cabbage, beets and cranberry jam. Rice pudding is the most popular dessert. You can have ‘ris à l’amande’, the pudding topped with whipped cream, vanilla and almonds or 'risengrød', hot rice pudding. A peeled almond is hidden in the pudding and the finder receives a small gift. The Juletræ is another important Danish tradition. In Denmark, the Christmas tree is always topped with a star rather than an angel as some others do. The tree is usually kept outside until Christmas Eve when it is taken inside to be decorated. In some families the tree is decorated together and other times the parents do it together to surprise the children. No matter how it comes to be decorated, the tree becomes a place to dance and sing carols around when it is up and lit. So, there are some of the interesting Danish traditions. I apologize for slacking for a couple of days, I know that there should be no excuses for getting in the way of my own education, as well as yours, but I've been very busy. There will be daily posts from now on! A tradition used in Ireland that is still practiced there and here as well, is that of hanging holly as Christmas decoration. Holly grows naturally in Ireland and is one of few plants to bloom in the winter. To the Ancient Celts holly represented life and rebirth. The evergreen leaves represented life during a time when there was no other life and the berries were symbolic of the coming of spring. When Christianity came to Ireland, the berries took new meaning as new life in Jesus. One interesting piece of folklore surrounding holly said that putting it out was a kind gesture to tiny fairies who hid in it from the cold. Holly wreaths on the door here started when the Irish immigrated here during the Great Potato Famine. On another plant-related note, the Celts also believed that mistletoe had healing properties. The powers of the plant were so great that it encouraged a momentary truce between even enemies. This is where the kissing under the mistletoe came from. Like the Scots, the Irish also followed the tradition of keeping a lit candle in the window to guide the Holy Family in their travel. If you had no light, you were saying "No Room" like the innkeeper of yore. Nobody would want to be guilty of turning away the Holy Family. Some other fun facts about Irish Christmas include the tradition of leaving mince meat pies and a bottle of Guinness out for Santa. Most children find their presents in a sack in their bedroom rather than under the tree or in a stocking. Also, they have something they call "Little Women's Christmas", which is January 6th. That day is just for women to go out and have fun while the men take care of housework, cooking and taking down the Christmas decorations. Traditionally it is bad luck to take down the decorations before this day. I hope you all enjoyed today's lesson. Remember to wish everyone a Nollaig Shona Dhuit and leave a Guinness out for Santa! Today there will be two blogs because yesterday I fell asleep learning about Scotland. Nothing personal, Scots, I was exhausted. Anyway, continuing on with learning about Christmas in other countries, I bring you a Scottish Christmas! The Scots tend to be a rather superstitious people, which makes for some interesting traditions. Although as in Russia, New Year's is the bigger event for the Scottish. This is because, like Russia, Christmas was banned for about 400 years. The ban was lifted in the 1950s. In Scotland it is very important that their fire burns all through the night on Christmas Eve. If the fire goes out, malicious spirits will make their way down the chimney and into your home! The Yule Log is also important to the fire. These are usually made from a birch or rowan tree and is cut and dried over the summer. On Christmas Eve, the log is brought inside and circled three times around the kitchen. Everyone makes a toast to the Yule Log and it goes into the fire. People used to check the ashes the next day and if they were foot-shaped, it would tell the future. A foot facing the door meant a death would come and a foot facing inward meant a new arrival. Lighting a candle and putting it in the window is symbolic of guiding a stranger to warmth and safety. It is also a symbol of lighting the way for the Holy Family as they traveled. Many people light bonfires to dance and play bagpipes around. People sing carols such as The First Nowell, Taladh Chriosta, and Bottom of the Punch Bowl. Decorations are hung and include the colors and patterns of tartans as well as evergreen branches. Traditional food for Nollaig Beag (Little Christmas) are Selkirk Bannock (see above), venison stew, Scottish shortbread, Scottish blackbun and Dundee cake. The Selkirk Bannock was originally made by a bakery in Selkirk, which is where it got its name. It is a festive cake made from flour, sugar, raisins and fruit peels. The blackbun is a very rich cake made of fruit, almonds, spices and flavored with whiskey. Because of the ban on Christmas for hundreds of years, the modern Scottish Christmas traditions are now similar to that of the United States and Britain. With gift-giving, cards and Santa Claus. The Scottish new year festival became more popular during the time of the ban, so it is still quite big. It's called Hogmanay and it is certainly a big thing. Scottish people prepare for Hogmanay by cleaning their homes in a purification ritual of burning juniper branches throughout the house. Haggis is the main food of the night as well as shortbread, scones, oatcakes, cheese, whiskey, wine and black buns. For those who do not know what haggis is, it is sheep parts (heart, liver and lungs) cooked with onion, oatmeal, suet, spices and salt. It is traditionally cooked in a cow's stomach, though modern haggis is sometimes made in sausage casing. It tastes about as good as it sounds. An old Scottish new year tradition still in practice today is called the "First Footer". The story goes that the first person to arrive in your home on New Year's Day would decide your family's luck for the rest of the year. This belief was based in the idea of the magic power of beginnings. The person you would prefer to see come into your house first would be a tall, dark haired man especially if he came bearing a gift. His handsome looks would make the year pleasant and his gift of a loaf of bread or shovel of coal would ensure the house would never be hungry nor cold. Anyone of an opposite type could cause disaster, which is why many folks would contrive to have just the right person arrive first in their home. As at Christmastime, bonfires are popular and sometimes a straw figure called Auld Wife, symbolizing the old year, would be thrown into the fire. An interesting old tradition was to banish evil of the old year into a cat or dog and then scare it away. On New Year's Eve, everyone would link arms together and sing Auld Lang Syne. On New Year's Day, the children will rise early and go singing to their neighbors in exchange for coins, candy, mince pies or apples. The children must hurry for anyone to sing after noon would be called fools. Nollaig chridheil! Today we continue our investigation of Christmas traditions around the world! Today we have a look at Wales. The Christmas traditions of Wales share a lot with their British neighbor, but there remain traces of ancient Welsh traditions. One of the most popular things in Wales for Christmas is caroling. The Welsh call it eisteddfodde and it's accompanied by the harp. Each village has a choir of trained singers, but everyone else joins in. Every year a new set of words is written and every village competes to make the best music to go along with it. The song that wins is sung during the next Christmas season by all the choirs and then is incorporated into the body of carols they sing from. This custom dates all the way back to the 10th century! In rural areas where old traditions remain, the Christmas religious service is called Plygain. It lasts from 4AM until the rising of the sun Christmas morning. Carols are sung by everyone at this candlelit service. The service was very popular many, many years ago, but died out during the 19th century. Methodist chapels began reviving it more recently. 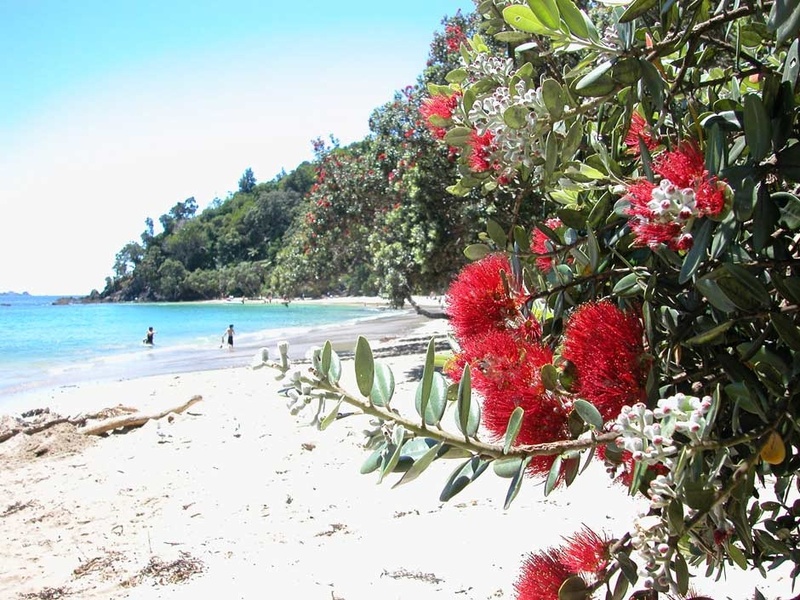 Another tradition surviving in certain places is the "Christmas Swim". This is practiced by the hardy people of Porthcawl. With the first swim beginning in 1965 with only about 6 swimmers, the tradition has continued to grow a little more every year! Last year's swim had 47 people participating and they give the money raised to local charities. Taffy making is another fun and delicious Welsh tradition. They create a special kind of toffee from brown sugar and butter. Then it's boiled and pulled until it's glossy and lovely looking. Another food tradition for a Welsh Christmas is the Christmas goose. Wassail is part of a traditional Welsh Christmas as well. Everyone would drink from the Wassail bowl, an elaborately carved and many handled bowl. It was filled with fruit, sugar and spices and then topped with warm beer. The drinkers would pass the bowl around and make a wish for a year of successful farming and a good bumper crop. In many areas, a man is chosen to be the Mari Lwyd (Grey Mare). The Mari Lwyd leads a group of merry-makers in disguise as they travel through the town. He is covered in grey and white fabric and carries a horse skull covered with ribbons on a long pole. Anyone given a bite by the skull has to pay a fine. They travel around to predetermined houses where Mari Lwyd bangs loudly on the door and sings impromptu verses. The families eventually invite them in for cake and cider. Wales is another country with a very interesting old New Year's Eve tradition. Years ago, children would go around bearing an apple totem (See the above picture). The children carried their fruit totem and a cup of water from the well and would go to houses and sing songs to spread good luck or else splash the people with water. It seems like an ancient trick or treat! Whoever answered the door might give the children a Calennig (small gift) such as cake, coins or sweets. The last tradition of the Christmas season is that by the Twelfth Night (January 5th), all remaining Christmas greenery is taken down and the last of the Yule Log is removed from the fireplace. The ashes from the log or any remaining pieces of log are planted with spring crops to ensure fertility. Continuing the Christmas lessons, today is a day for curry and saris, for we are having a look at the Christmas traditions of India! Hinduism and Islam are the main faiths in India, however there are enough Christians in the country (26 million out of over a billion) that Christmas has found its place there. 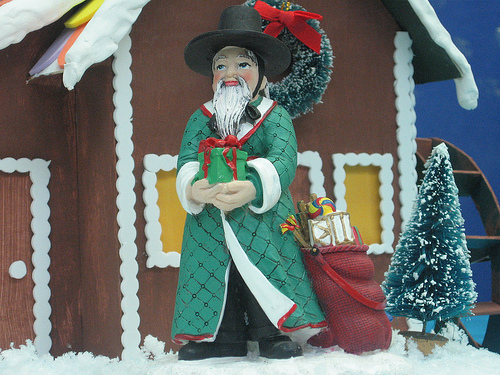 In the larger cities, carolers walk along the streets, the bazaars are dressed up for Christmas and have special discounts and Father Christmas appears in department stores. The way Christmas is celebrated in different ways depending on location. In Southern India, they place small clay oil-burning lamps on the tops of walls or on the edges of flat roofs. In Northwest India, there is a tribe of Christians called the Bhil people. They go out to sing carols and tell the Christmas story to the surrounding villages. One of the largest Christian communities in India is in Bombay, with many people there being Roman Catholic. Many families put a nativity scene in their windows, where others in the neighborhood can walk through and admire the lovely scenes their neighbors constructed. They also hang large paper star lanterns, creating a beautifully colored sky. Some homes have artificial pine trees while others decorate mango or banana trees instead. The British influence left from before the independence of India, left the idea of gift-giving during the Christmas season. This is why they have Father Christmas. The Christian Indians also practice giving baksheesh to (charitable handouts) to the poor. The traditional Indian Christmas dinner is turkey or chicken with curried rice and vegetables. Some houses serve homemade ginger wine with dinner. Each household also makes a generous supply of sweets ready to serve all the visitors who come during the day. The Indians make special red or pink dough pastries called Kulkul, Laado, Chaklyo and Nevryo. Now you know the basics of how the Indian people spend their Christmastime. Tomorrow we may actually have a look at Germany. Haha. मेरी क्रिसमस! Continuing along with our lessons about other countries' Christmas traditions, we come to Spain. 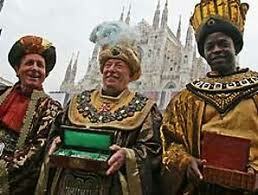 In Spain, the children believe the three wise men, Melchor, Gaspar and Baltasar, bring their gifts. The wise men arrive in town on January 5th and the people come out to see them ride through. They give out gifts and candy along the procession and then everyone goes home. The children leave hay or barley in their shoes for the camels. In the morning, the food is gone and they find candy or small presents in their shoes. Christmas season in Spain officially begins on the 8th of December with the Feast of the Immaculate Conception. The feast is celebrated with a ceremony in front of a cathedral in Seville where a ritual dance called los Seises is performed. Although los Seises means the dance of the six, it is actually performed by ten boys in elaborate costumes. Most homes have a large manger scene, like you would find in a church. They gather around it and sing while the children play tambourines and dance. The Spanish have special respect for the cow at Christmas. They believe the cow breathed on baby Jesus and kept him warm. What a nice critter! There is one tradition the Spanish have that isn't found anywhere else in the entire world! It's called Hogueras (bonfires) and it dates back to pre-Christian Spain. In observance of the Winter Solstice, people will jump over bonfires in order to protect against illness. You can still see fire-jumpers mainly in Grenada and Jaen. On Christmas Eve, families gather and prepare the dinner for later. At midnight, bells will ring, calling the families to La Misa de Gallo (The Mass of the Rooster). Following the service, it is finally time to eat! They serve Pavo Trufado de Navidad (Christmas turkey with truffles). Following dinner, the people will gather in the streets and dance the Jota, a special Christmas dance with words and motions that have been passed down for hundreds of years. Those who are not dancing either watch or play guitar or castanets. Then the family will gather around the tree and sing Christmas carols. The celebration goes on until early in the morning. Christmas Day is spent at church, with family eating food or just enjoying each other's company. Another tradition that is original to Spain is 'swinging' on Christmas Day. Swings are set up in courtyards and young people swing as they sing and talk. Before Epiphany arrives, bringing the Magi, there is the Feast of the Holy Innocents. During this day, boys from the town light bonfires while one acts as the mayor and instructs citizens to perform civic chores, like sweeping the streets. People must obey or they pay a fine, which contributes to the next year's feast. Feliz Navidad! In honor of the Christmas season, I continue to learn about other cultures and the way they celebrate. I said yesterday that I planned to write about Germany, but they have so much going and I got a late start writing, so I decided on something that wouldn't be as long. So today is a day for sushi and Buddhist monks! We learn about Christmas in Japan! Those that read my blog about Korea know that Korea is the only Eastern nation that has Christmas as a public holiday. In Japan, Christmas is not a public holiday, but the 23rd is the birthday of the present emperor, so that is. Because less than 1% of Japanese are Christian (though the rest are tolerant of all faiths), Christmas is rather different from what we are used to. With no religious connotation for most of the population, Christmas is all commercial and is also not the family affair that we have. Interestingly enough, Christmas there is much like our Valentine's Day. It's a very romantic holiday to be spent with one's significant other. They get each other cute gifts like teddy bears, flowers and jewelry. One thing they do as a family is have a Christmas Cake. The father of the family buys one and brings it home with him for the family to have together. Stores all have different versions of the cake and on the December 25th the prices drop drastically in order to sell everything out by the next day. This has resulted in an expression I found hilarious. Young girls are referred to as Christmas Cakes because at 25 they are marriageable but by 26 they require heavy discounts to find marriage. (I'm 25, So I'm a Christmas Cake). Aside from the cute presents Japanese get each other, there were also obligatory year-end gifts for bosses, teachers, people who were kind to you during the year. These are called Oseibo and are usually foods or soap for the house. These days most Japanese under 50 have never given or received an Oseibo. They see this as something that their parents did, but they do not want to do. They prefer the personal expression of gift-giving that Christmas brings rather than social obligation. The Japanese also have a practice of year-end parties called bonenkai, which is a party for forgetting the old year. These are parties for drinking and because there are many at this time of the year, it leads to many people on the sidewalks, subways and trains in various states of intoxication. Another really interesting thing is because of the clever marketing of KFC, most Japanese have fried chicken for Christmas and see it as traditional! Back in the 70s a KFC customer in Japan noted that with a land bereft of a traditional turkey dinner, chicken would be the next best thing. This eventually made up to the bigwigs and they came up with the slogan: “Kurisumasu ni wa kentakkii!” (Kentucky for Christmas) in 1972. I learned a lot of interesting things about the Japanese and what they do at Christmas time. I hope you all had fun learning too! 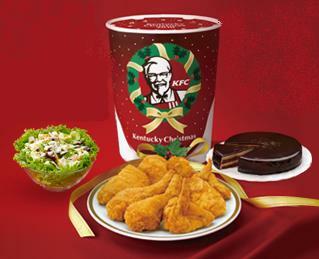 Now we know to go get KFC for Christmas. メリークリスマス! Bonjour! In honor of the holiday season, I am still learning about other countries' Christmas traditions! Today we visit France, home of Pere Noel and a frightening fellow called Le Pere Fouettard. If you read about the Dutch traditions, you know that they have Zwarte Pieten to keep their kids in line. And that is what Le Pere Fouettard is for. He is essentially the Boogeyman, there to strike fear into the hearts of naughty children. After reading his backstory, I can see why he would be so frightening. The story is part of the St. Nicholas legend. Three boys were lost in the fields and they stop at a house to seek shelter for the night. The man who lives there is a butcher. He lets the kids in but rather than welcoming them with hospitality, he chops them up and throws them in to jars to pickle with his meat. St. Nicholas appears, which is after he was killed, so the butcher knows he is there for the boys. St. Nicholas calls the boys to him and they appear alive and whole. The butcher regrets what he did and so repentant he chooses to follow St. Nicholas and help him anyway he can. This story led to Le Pere Fouettard (Which means whipping father, by the way) accompanying Pere Noel (Father Christmas). While Pere Noel has much in common with our Santa, in many places in France, he is still followed by Le Pere Fouettard, who is there to whip the naughty children. In some of the older stories, he was known to cut out the tongues of the children who lied! I would not want to cross this man. Interestingly enough, until the 1950s, the Nativity was the main symbol of Christmas in France. These days, many parts of France that are less traditional have mostly forgotten the use of Le Pere Fouettard, but they still have Pere Noel. The main difference between Pere Noel and Santa Claus is that Pere Noel rides on a single donkey called Gui (Misletoe). When France began to embrace their Santa Claus and other non-religious icons of Christmas, religious authorities in Dijon set fire to an effigy of Santa Claus in protest. They called Santa a usurper and a heretic and said he was paganizing Christmas! Wow! Like children here in the States, French children write letters to Pere Noel. They all do so in class and because of a law passed in 1962, all letter written to Santa must receive a postcard so that everyone in the class would get a response! French children also leave hay for Gui in their shoes and receive small presents or candy in return, like the Dutch. The presents under the tree are usually opened on December 24, following their Christmas dinner, which they call Reveillon. In the past, Reveillon signaled the end of a four day advent fast, but that is no longer practiced. In Paris common réveillon dishes include goose liver pâté, roast turkey or roast goose stuffed with prunes and pâté, special preparations of potatoes and vegetables, cheese, fruit, nuts, and for dessert, bûche de Noël (Christmas log), a special chocolate, cream-filled cake shaped like a log. Other regions have their own special traditions. For instance, in Southern France, there is a choice of 13 desserts, one for Jesus and each apostle. Common dessert foods are fresh and dried fruits, marzipan, sweetbread and cookies. I am finding it very interesting that so many Christmas legends involved these scary people to frighten the bad children. When I think of Christmas stories, boogeymen aren't usually what comes to mind and I didn't know that any of them existed before this week. I hope you're all learning as much as I am! Tomorrow, Germany! Joyeux Noël! Because I failed to have my post up yesterday, I'm throwing in another for today to make up of the lost day of learning you all suffered. Today we will learn about Santa Haraboji, the Santa of South Korea. Because Western culture and Christianity are still fairly new in Korea, many of their celebrations are the same as what we do here or what Europeans do. They do have their own version of Santa. His name is Santa Haraboji, or Grandfather Santa. He sometimes appears looking like our Santa, but he can also appear in a traditional Korean gat (the hat he is wearing) and of course, his features are Asian. Christmas is called Sung Tan Jul. This time of year in Korea, people are mostly doing the same things that we do here. One of the differences is, Korean cards are less expensive than ours and feature Korean landscapes, outdoor scenes or other artwork. Instead of Merry Christmas, most say Seasons Greetings so as to be accepted more widely by the population of mostly Buddhists. Korea is in fact, the only Eastern Asian nation to recognize Christmas as public holiday. One of other main difference is their delicious food! Christmas dinner in Korea isn't ham and potatoes like we have. They are likely to have sweet potato noodles, rice cake soup, bulgogi (barbecued beef) and gimchi (spicy pickled cabbage). Lastly, because Christmas is largely a religious holiday there as opposed to the tradition other countries have with gift-givers, only some Korean families put up a Christmas tree. There is less fanfare and decoration involved. Overall, it sounds like a fun and tasty way to celebrate! 메리 크리스마스! Continuing on with our Christmas lessons, today I learned about Ded Moroz and Snegurochka, the Christmas characters of Russia, Ukraine and all the Slavic East Europe countries. First, let's start with a little history, because what story doesn't need history? We're talking Russia, so feel free to play with your matryoshka and do a vodka shot before you read. Originally, as in most every place with a gift-giver legend, St. Nicholas was that guy. He became the Patron Saint of Russia and they celebrated his feast day on the 6th, like the Dutch. However, because the Russian Orthodox Church uses the Julian calendar, their December 6th is January 7th for the rest of the world. (Confusing, isn't it?) Nonetheless, that was the day of their St. Nicholas day celebration, which was their Christmastime. With the Reformation in the 17th century, Protestants decided they didn't want anything to do with St. Nicholas because he was such a Catholic figure. Secular gift-givers had begun to appear in other areas and this led to the introduction of Ded Moroz (Father Frost) in Russia. Unlike the Santa Claus of the States, Russia's gift-giver is tall and thin! Of course, he also wears traditional Russian garb and rather than flying reindeer he travels by troika, which is a sled pulled by three horses. He also travels with Snegurochka (Snow Maiden), which is his granddaughter. Snegurochka is originally from an interesting Russian fairy tale, but in this legend, she is granddaughter of Ded Moroz and assists him in his gift-giving. 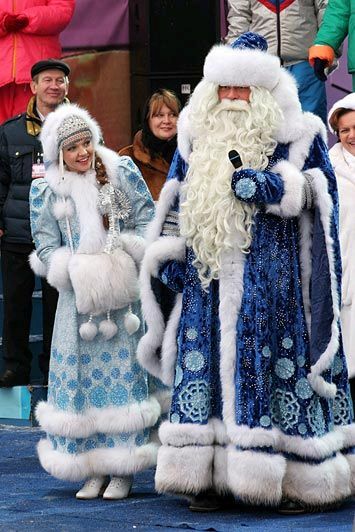 The truly interesting thing about Ded Moroz, is he was also already a Russian icon before becoming their gift-giver. He appears in early pagan tales as an evil sorcerer! He enjoyed freezing people and kidnapping children. He would take the children away in a giant sack and parents had to give him presents in order to get their children back! Somehow with the influence of Orthodox tradition as well as the myths of gift-givers, he evolved into a new figure. The fun of the season would be brought to a halt with the Bolshevik Revolution and Lenin coming to power. The Communist Party created an atheistic society and therefore Christianity and Christmas itself, were outlawed. In its place New Year's Day became the new winter holiday. In an attempt to keep traditions, families gathered around their yolochka (New Year's Tree) and exchanged presents. Secular Christmas would be no more, but Ded Moroz was alright. He was not church-related and he continued to deliver gifts during that time. Stalin made it a point to order all Ded Morozes to wear only blue coats because he didn't want them to be confused with our Santa Claus. There is much symbolism involved in this meal. The family gathers around the table, covered in white linen to symbolize the swaddling clothes of the baby Jesus. Hay is brought out to remind everyone of the poverty of the cave where the baby was born. Then a tall, white candle is lit in the center of the table. This symbolizes Christ as the "Light of the World". A large loaf of Lenten bread is placed next to the candle. The father of the family begins the meal with the Lord's Prayer, then a prayer of thanksgiving for all the year's blessings is offered as well. The father greets everyone by saying, "Christ is born!" Everyone in turn responds, "Glorify him!" The mother then blesses everyone at the table with a cross of honey on the forehead as she says, "In the name of the Father, the Son and of the Holy Spirit, may you have sweetness and many good things in life. and in the new year." After the blessings, everyone eats bread dipped in honey to symbolize the sweetness of life and chopped garlic to symbolize its bitterness. Then they may eat the Holy Supper. After this, they do not do the dishes, they open Christmas presents. Following that, the family goes to church and returns around 2 or 3 AM. The following day, the Feast of the Nativity, entails visiting neighbors and family for drinking, eating and singing Christmas carols all day! So there you have it, Russian Christmas and New Year traditions all in one article! You've learned a lot today, good for you! С Рождеством! Today I learned about Sinterklaas and the Dutch traditions for Christmastime. I decided in honor of the holiday season, to learn about how people in other countries enjoy their Christmas and how their Santa Claus works. So take a break from stringing up the lights and get your eggnog, it's time to learn! Sinterklaas is said to have the biggest influence on how we got our Santa Claus. You can see the similarity in the name and he looks the most like our Santa. The Dutch tradition has Sinterklaas in the robes of a holy man and wearing a bishop's hat, but when he was modernized and brought to America, he lost the holy connections. Even in the Netherlands, the tradition has changed through the years. Sinterklaas likely began with the Norse legend of Odin. Similarities between the two include both riding through the sky on a horse and carrying a staff or spear. The helpers of Sinterklaas are mischievous with black faces. This is similar to Odin's ravens Hugin and Munin who acted as his informants. Sinterklaas also drew from the myth of Saint Nicholas. Because his remains were buried in Spain, he was said to be from there and had a black helper who was shown as a Morisco pageboy. In Spain, St. Nicholas is the patron saint of sailors as well as children, thus he arrives by steamboat in the Dutch legend. Because of the traditional depiction of St. Sara Lee Nicholas, Sinterklaas is said to have many mischievous helpers with black faces and Moorish clothing called "Zwarte Pieten" (Black Petes). When the legend arose, Zwarte Piete was a name for evil, a symbol of the devil placed in a position where he must help. Although with the passing of time, the racial connotations showed through. During the Middle Ages, a feast was held on December 6th for the children in honor of Sinterklaas. At the feast, money was put in children's shoes which led to the later tradition of putting presents in shoes. The feast became a wild scene of debauchery, similar to Carnival. It featured costumes, role-reversal and mass drunkenness. In the 16th and 17th centuries, the Netherlands became largely Protestant and banned the celebration of Sinterklaas. The Southern part of the Netherlands as well as Catholic students in Amsterdam protested and practice was allowed at a family level. By the 19th century, Sinterklaas became widely accepted again. A schoolteacher named Jan Schenkman illustrated a children's book which depicted Sinterklaas taking presents down the chimney, riding a horse through the sky and coming from Spain on steamboat, which at the time was marvelously new. In this new incarnations of the story, Sinterklaas' medieval devil helpers were replaced with a black boy he called Zwarte Piet. This boy helped Sinterklaas and traveled with him. These days, Sinterklaas' arrival to the country is now televised and following that, all towns with docks have a local arrival via boat as well. Any place without a dock has him arrive on horse, train or carriage. Many people dress up as Zwarte Pieten, still with traditional black face makeup, because of the original legend of the Zwarte Piet who stayed with Sinterklaas because Sinterklaas freed him from slavery. Of course with the politically correct police patrolling, this has been changed to say his face is black from soot because he is the one to go down chimneys to deliver presents or coal. On the eve of St. Nicholas Day, called Pakjesavond, the children still place a shoe, calling back to the original medieval feast! The children put a treat for Sinterklaas' horse in their shoe, such as hay, a carrot or an apple and on the next day they find candy or small presents in their shoe. On the evening of that day, the main presents arrive mysteriously somehow, depending on families. Sometimes a note will be found explaining where the gifts were hidden in the house, or a neighbor may knock on the door and leave the sack of presents. The entire Dutch family enjoys something like a Secret Santa within their family. They give a special gift called a surprise for their family member. These gifts come with a Sinterklaas poem which is usually a silly poem that pokes fun at the family member. The gifts are cleverly disguised for the recipient. Sinterklaas and Zwarte Piet are depicted as carrying a bag of candy for the good children and a chimney sweep's broom for swatting the bad children. Although in older Sinterklaas songs, they say that Zwarte Piet would take the bad children back to Spain in the sack. So look out kiddies, Zwarte Piet is coming for you! Gelukkig kerstfeest!